Two Senses of the Term. The term occurs only in the Apocryphal books (Wisdom xiv. 3, xvii. 2), and has no equivalent in Biblical Hebrew, the later philosophical writers employing "hashgaḥah" as a translation for the Arabic "'inayah." "Providence" is employed to connote (1) God's "actio æterna" (His foreknowledge and His dispositions for the realization of His supreme will [πρόγνωσις and πρόϑεσις]), and (2) God's "actio temporis" (His power to preserve and to control the universe and all that is therein). Most theologians use the term solely in the latter sense, to which, therefore, the following discussion is confined. The doctrine of the providential care and government of the world is found among non-Jewish and, perhaps, non-monotheistic authors (comp. Cicero, "De Natura Deorum," ii. 30 et seq. ; Seneca, "De Providentia"). Socrates argues that a beneficent providence is manifest in the construction of the human organs (Xenophon's "Memorabilia," i. 4, § 2). The faith in providence, Yhwh's all-sustaining and directing care, more especially manifest in His relations to His people Israel, is variously, but always clearly, expressed in Hebrew Scriptures. Though nowhere presented in coherent systematic form, the Biblical belief in providence reflects the spontaneous religious consciousness of humble and confident believers rather than the reasoned deductions of strenuous thinkers. From heaven the Eternal looks down; He sees all the sons of man (Ps. xxxiii. 13, 14). In the heavens the Eternal has His throne, but His government encompasses all (Ps. xi. 4). God's realm embraces all the worlds (eons), still His rule extends over every generation (Ps. cxlv. 13). God is King ( ) and Shepherd (Ps. xxiii. 1). God is the Record-Keeper (Ps. cxxxix. 16). Nature is constantly the object of divine sustaining solicitude, and always under divine direction (Job xxxvi. 27, xxxviii. 25; Isa. xi., xii. ; Jer. xxxiii. 31-35; Ps. lxvi. 8 et seq. ; civ. 13, 29, 30; cxlvii. 14-18). God provides food in due season for all (Ps. cxlv. 16). Man is uninterruptedly under divine care (Ps. xxii. 10; Job xiv. 5). God directs the course of human affairs, the fate and fortune of the peoples (Ps. xxxvii. 5. xlvi. 10, lxvi. 7, xci. 1-7, civ. 13-16; Prov. xvi. 4; Dan. ii. 21, iv. 14; Isa. x. 5-10; Jer. v. 24, xviii. 7-8; Job xxxvii. 2-7; Amos iv. 7). In the life of the Biblical heroes the reality of this divine guidance and protection is prominently brought out (Gen. xxiv. 7; xlviii. 4, 15, 20). But it is Israel that is eminently the beneficiary of divine solicitude, witnessing in its own fortunes God's providence (comp. Deut. xxxii.). Essentially interwoven with the Biblical doctrine of the Messianic kingdom is the thought that the providence of God, the Ruler, is effective in the conflicts and relations of the various peoples. A necessary corollary of this faith in providence was the optimism which characterizes the Biblical world-conception. Evil was either caused by man, who had the freedom of choosing, or was disciplinary and punitive; in either case it served the end of divine providence. The sinner was, perhaps, the dearest object of divine watchfulness and love (see Optimism and Pessimism). The simple faith of the Biblical writers never stopped to inquire how providence and human freedom could be shown to be congruous. The position of the Tannaim and Amoraim is not essentially different from that taken in the Biblical books. Their opinions may be gathered from scattered homiletical and exegetical comments, from parables and anecdotes; but no systematic presentation may be reconstructed from these detached observations of theirs. The following quotations may throw light on the underlying theology: All that God does is for a good purpose (Ber. 60b). According to R. Akiba, every event is predetermined, though liberty is given. The world is judged in goodness, yet the decision is rendered in accordance with the predominating character of man's conduct (Ab. iii. 24; Ab. R. N. xxxix.). All is determined and all is finally made plain. Even in the seeming irrationality of the prosperity of evil-doers and of the suffering of the righteous, God's purpose is effective (Ab. iii. 16; Yoma 86b). God is pictured as making ladders, on which He causes some to ascend and others to descend; in other words, God is the Arbiter of men's fate and fortune (Lev. R. viii. ; Gen. R. lxviii. ; Pesiḳ. 11b; Midr. Shemu'el, v.; Tan., Bemidbar, 18). Moses, praying for insight into God's ways, learns why evil-doers prosper and the righteous suffer (Ber. 7a). God protects Palestine and, on its account, all other lands also. He guards Israel and other nations as well (Sifre, Deut. 40). None may wound a finger unless it be so decreed above (Ḥul. 7b). God's protection is not like that extended by man to man. Royal servants watch in the streets over the safety of the king in the palace. God's servants remain in their houses while He, the King, watches over them from without (Men. 33b; 'Ab. Zarah 11a, with reference to the mezuzah). God's providential care is especially extended to those that "go down the sea in ships," to travelers in the desert, and to those that are recovering from illness (Jellinek, "B. H." i. 110). Rain and the miracle of human birth are often adduced as evidences of divine providence (Ta'an. 2; Lev. R. xiv. 2-3). Serpents, lions, even governments, work harm only under God's decrees (Eccl. R. x. 11). Deut. xxxi. 15 is invoked to prove that man's physical condition and moral and mental qualifications are predetermined by providence before birth, though freedom of choice is allowed to him (Tan., Piḳḳude; Yalḳ. ii. 716). The actions of the leaders in history were predetermined in God's council at Creation ("B. H." i. 1; Pirḳe R. El. xxxii.). The old prayers affirm this doctrine; God's creative activity is uninterrupted (so in "Yoẓer Or": "He creates anew every day the works of the beginning"). 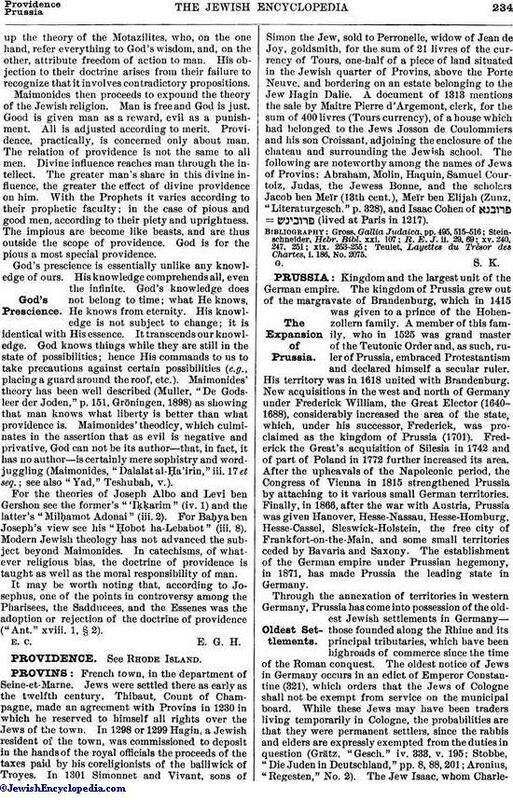 His governing providence is manifest in Israel's history (see Ahabah Rabbah). He helps and sustains the living, resurrects the dead, supports the falling, heals the sick, delivers the captive (second benediction of the Shemoneh 'Esreh). Inthe New-Year liturgy (Rosh ha-Shanah, Netanneh Toḳef) God's kingship ("malkuyot") is especially emphasized, as well as His predetermination of the fate of individuals and nations—a conception occurring also in a baraita, Beẓah 15b, 16a, with reference to man's sustenance and nourishment. God's wise foresight is manifest even in the creation of the wind, which makes profitable man's labor in plowing, hoeing, planting, harvesting, and mowing (Pesiḳ. 69a; Lev. R. xxviii. 2). God provides food for every man (Lev. R. xiv. 2). As in the Bible, in the Talmud the moral liberty of man and God's providential rulership are taught together, without further endeavor to show their compatibility. "Everything is in the control of God save the fear of God" (Ber. 33b; Meg. 25a; Niddah 16b). If the doctrine was, for the Talmudists, partly the expression of spontaneous religious feeling, partly the result of their labored exegesis of Biblical passages, Philo's presentation is that of the trained, systematic thinker. God being the benevolent author of the world, He must continue to exercise providential care over the whole and every part of it, for it is natural for parents to provide for their children ("De Opificio Mundi," § 61). God holds the reins of the cosmos by an autocratic law ("De Migratione Abrahami," § 33). He is the "archon of the great city, the pilot who manages the universe with saving care" ("De Confusione Linguarum," § 33). In the exercise of this providential care God's goodness is poured forth with unrestricted lavishness ("De Allegoriis Legum," i. 13). His judgments are tempered with mercy ("Quod Deus Sit Immutabilis," § 16). The recipients of God's bounties being of limited capacity, God measures His gifts accordingly ("De Opificio Mundi," § 6). Philo does not conceal the objections to the faith in providence. He endeavors to meet them, more especially in a treatise entitled "De Providentia" (see Drummond, "Philo Judæus," ii. 58). The existence of pain he endeavors to explain on the ground that God can not be held to be its author in all cases, as well as on the ground that often evil is good in disguise. Evil is prophylactic at times, disciplinary at others. Men who are righteous in our eyes may perhaps be sinners, and deserving of punishment (Drummond, l.c.). The rise of Islam and the disputes engendered in its household concerning predestination and free will had the effect of stimulating Jewish thinkers in the Middle Ages to make a more profound analysis of the doctrine. How was human liberty reconcilable with God's foreseeing, fore-knowing, omnipotence? The question constituted the crux of their disquisitions. Saadia discusses it in the fourth chapter of his "Emunot we-De'ot." Arguing that God's knowledge of things does not necessarily result in their reality and existence, Saadia proceeds to maintain that God's prescience is due to His knowing the ultimate outcome of human conduct, though it is not He that brings it about. But in a case in which God wills that a certain one be killed and employs another as the instrument of His will, is the murderer to be accounted responsible or not? Saadia would have the murderer adjudged accountable. He might have refused to do the act, in which case God would have employed other means to bring about the death of the sinner. The weakness of Saadia's argumentation is apparent. 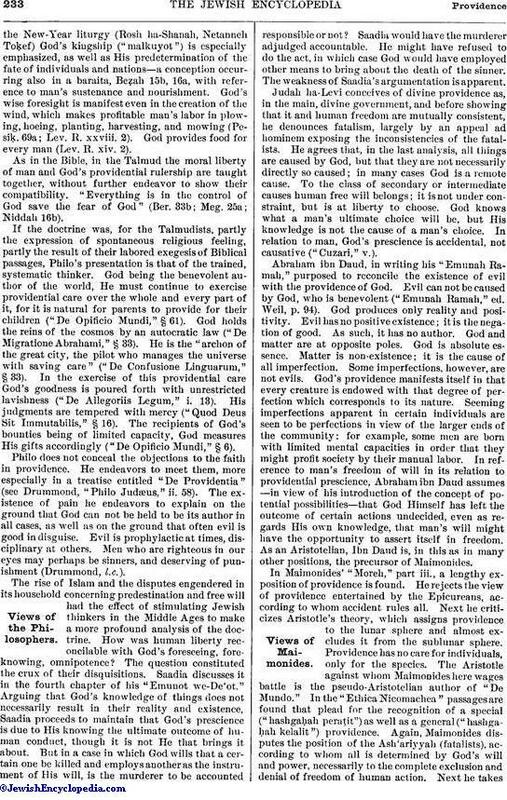 Judah ha-Levi conceives of divine providence as, in the main, divine government, and before showing that it and human freedom are mutually consistent, he denounces fatalism, largely by an appeal ad hominem exposing the inconsistencies of the fatalists. He agrees that, in the last analysis, all things are caused by God, but that they are not necessarily directly so caused; in many cases God is a remote cause. To the class of secondary or intermediate causes human free will belongs; it is not under constraint, but is at liberty to choose. God knows what a man's ultimate choice will be, but His knowledge is not the cause of a man's choice. In relation to man, God's prescience is accidental, not causative ("Cuzari," v.). Abraham ibn Daud, in writing his "Emunah Ramah," purposed to reconcile the existence of evil with the providence of God. Evil can not be caused by God, who is benevolent ("Emunah Ramah," ed. Weil, p. 94). God produces only reality and positivity. Evil has no positive existence; it is the negation of good. As such, it has no author. God and matter are at opposite poles. God is absolute essence. Matter is non-existence; it is the cause of all imperfection. Some imperfections, however, are not evils. God's providence manifests itself in that every creature is endowed with that degree of perfection which corresponds to its nature. Seeming imperfections apparent in certain individuals are seen to be perfections in view of the larger ends of the community: for example, some men are born with limited mental capacities in order that they might profit society by their manual labor. In reference to man's freedom of will in its relation to providential prescience, Abraham ibn Daud assumes—in view of his introduction of the concept of potential possibilities—that God Himself has left the outcome of certain actions undecided, even as regards His own knowledge, that man's will might have the opportunity to assert itself in freedom. As an Aristotelian, Ibn Daud is, in this as in many other positions, the precursor of Maimonides. In Maimonides' "Moreh," part iii., a lengthy exposition of providence is found. He rejects the view of providence entertained by the Epicureans, according to whom accident rules all. Next he criticizes Aristotle's theory, which assigns providence to the lunar sphere and almost excludes it from the sublunar sphere. Providence has no care for individuals, only for the species. The Aristotle against whom Maimonides here wages battle is the pseudo-Aristotelian author of "De Mundo." In the "Ethica Nicomachea" passages are found that plead for the recognition of a special ("hashgaḥah peraṭit") as well as a general ("hashgaḥah kelalit") providence. Again, Maimonides disputes the position of the Ash'ariyyah (fatalists), according to whom all is determined by God's will and power, necessarily to the complete exclusion and denial of freedom of human action. Next he takesup the theory of the Motazilites, who, on the one hand, refer everything to God's wisdom, and, on the other, attribute freedom of action to man. His objection to their doctrine arises from their failure to recognize that it involves contradictory propositions. Maimonides then proceeds to expound the theory of the Jewish religion. Man is free and God is just. Good is given man as a reward, evil as a punishment. All is adjusted according to merit. Providence, practically, is concerned only about man. The relation of providence is not the same to all men. Divine influence reaches man through the intellect. The greater man's share in this divine influence, the greater the effect of divine providence on him. With the Prophets it varies according to their prophetic faculty; in the case of pious and good men, according to their piety and uprightness. The impious are become like beasts, and are thus outside the scope of providence. God is for the pious a most special providence. God's prescience is essentially unlike any knowledge of ours. His knowledge comprehends all, even the infinite. God's knowledge does not belong to time; what He knows, He knows from eternity. His knowledge is not subject to change; it is identical with His essence. It transcends our knowledge. God knows things while they are still in the state of possibilities; hence His commands to us to take precautions against certain possibilities (e.g., placing a guard around the roof, etc.). Maimonides' theory has been well described (Muller, "De Godsleer der Joden," p. 151, Gröningen, 1898) as showing that man knows what liberty is better than what providence is. Maimonides' theodicy, which culminates in the assertion that as evil is negative and privative, God can not be its author—that, in fact, it has no author—is certainly mere sophistry and wordjuggling (Maimonides, "Dalalat al-Ḥa'irin," iii. 17 et seq. ; see also "Yad," Teshubah, v.). 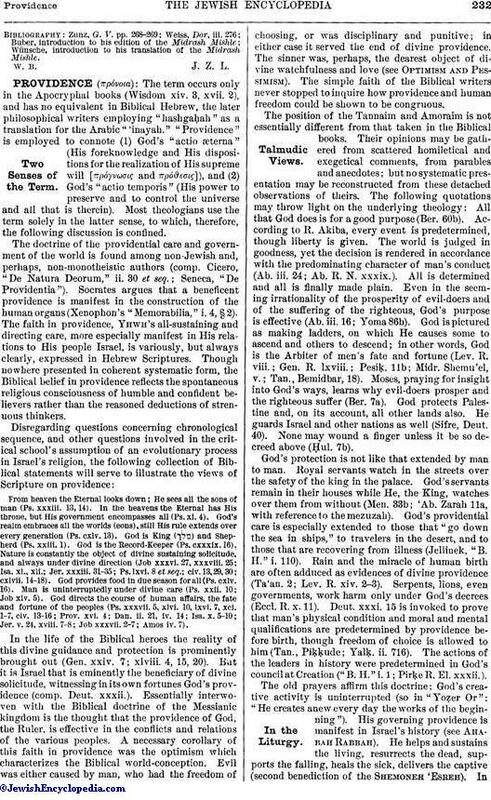 For the theories of Joseph Albo and Levi ben Gershon see the former's "'Iḳḳarim" (iv. 1) and the latter's "Milḥamot Adonai" (iii. 2). For Baḥya ben Joseph's view see his "Ḥobot ha-Lebabot" (iii. 8). Modern Jewish theology has not advanced the subject beyond Maimonides. In catechisms, of whatever religious bias, the doctrine of providence is taught as well as the moral responsibility of man. It may be worth noting that, according to Josephus, one of the points in controversy among the Pharisees, the Sadducees, and the Essenes was the adoption or rejection of the doctrine of providence ("Ant." xviii. 1, § 2).